Have you ever wished for something in a wishing well or fountain before? Did you get what you wished for afterwards or did nothing happen then? We all want to believe in the power of wishes and how strongly they can change our lives forever. They say in Rome, Italy, there is a fountain called a Fountain of Love. It is a place where people can throw their coins in after thinking of a wish that their hearts truly desire. Nobody knows if there is any truth in this but people still keep on believing it. 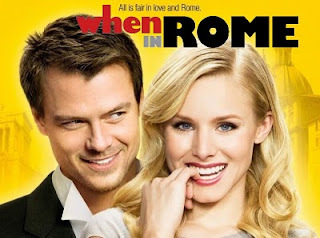 In the movie, When In Rome, Kristen Bell stars as Beth, a young but successful workaholic curator who can't seem to find time for love. Her life changes when she takes a trip to Rome, Italy for her younger sister's wedding. There she meets Nick played by Josh Duhamel, her brother in law's college friend and best man, who helps her through difficult situations while in the wedding. Beth thinks that maybe Nick is interested in her but when she tries to meet him outside the church, she realizes that he was seeing someone else. Feeling betrayed, she decides to drink some wine while wadding into the Fountain of Love. Out of bitterness, she decides to take 5 different coins from the fountain to prove her theory that whoever wishes in that fountain will never truly find love. She goes back to America the next day not knowing what she had done. Back in America, she goes back to work and suddenly realizes that 4 strange men seem to know her when she has no idea who they are and where they came from. She also receives calls from Nick who was interested in seeing her again some other time. Not yet realizing what she had done, she decides to call her younger sister, who was living in Italy. She then explains to her that she needs to return the coins back to the Fountain of Love in order for the spell to be broken. She tries to avoid them all after that. Nick decides to ask her out again on a date but things don't go well on their planned date, they decide to just go back to the museum and talk. After an intimate moment together, they head back to Nick's place, only for her to find out that Nick plays poker and that perhaps he is also one of the men charmed by her spell. She decides to leave him without explaining, leaving Nick wondering why. On the day of the gala, her younger sister calls her and tells her of another way to break the spell. All she has to do is to simply return the coins to their respective owners and she will be rid of them forever. She calls on her unwanted suitors and as she was about to give the coins, she realizes that her assistant had taken them to the gala. She decides to bring the four men with her to the gala and give them their coins there. Upon returning their coins, their memories returned to them and they too realized what had happened. With the love spell gone, Beth only has one coin left to return. It was Nick's chip but as she was about to do so, one of her unwanted suitors, the magician, decides to use it as a prop for his disappearing magic trick. As she tries to get it from him, it rolls to the ground only to find Nick. With the chip returned to Nick and with him still in love with her, she realizes that its all for real. However on their wedding day in Rome, her unwanted magician suitor reveals to her that he accidentally gave her the wrong chip that day and that he still had the original piece that he wanted to return to her. Right there and then, Beth started to doubt Nick's love for her once again. As they were about to say their "I do's", Beth decides to say no and leave Nick hanging at the altar. She revisits the Fountain of Love where she originally picked up the coins and climbs in like before. Nick appears and climbs into the fountain. He claims that he didn't throw a chip into the fountain at all. He drops the poker chip in the water and in the background, you can see and hear the priest yelling "Free of temptation!". From that moment, Beth finally believes Nick and kisses him. We all can find true love somehow. One way or another. We don't need to wish on a wishing well or on a fountain of love. All we have to do is to keep on believing. This movie definitely had funny moments. The unwanted suitors definitely were entertaining. Kristen Bell was a vision in this film and while Josh Duhamel may have been a bit forgettable, he is still had his moments. This wasn't exactly a perfect movie to watch however it was still entertaining. Finally, they seal their love with a kiss. What's even more romantic was they did it while standing in the Fountain of Love, never minding what others would say and that others would look. *SIGH* Isn't that just dreamy? I seriously wanted to go there a lot when I was single. For some strange reason, I really wanted to even before I got married. Sadly, I never did. But yes, I would still love to go to Europe someday. If not in this life perhaps in the next. I don't know about a fountain of love, but they do say that if you throw a coin in the Fontana di Trevi, you will return to Rome. I didn't do it when I was there, since I was waiting for my husband (he was busy when I saw it), so we would both return together. We didn't end up having time to go back, but I still hope to go back to Rome someday. It's the most beautiful city I've ever been to. Hey Theresa! Thanks for telling me about Rome and that Fontana De Trevi. Sounds like a real beautiful place. I hope to see it in the future too. Hopefully, you and your husband will be able to go back there again next time.